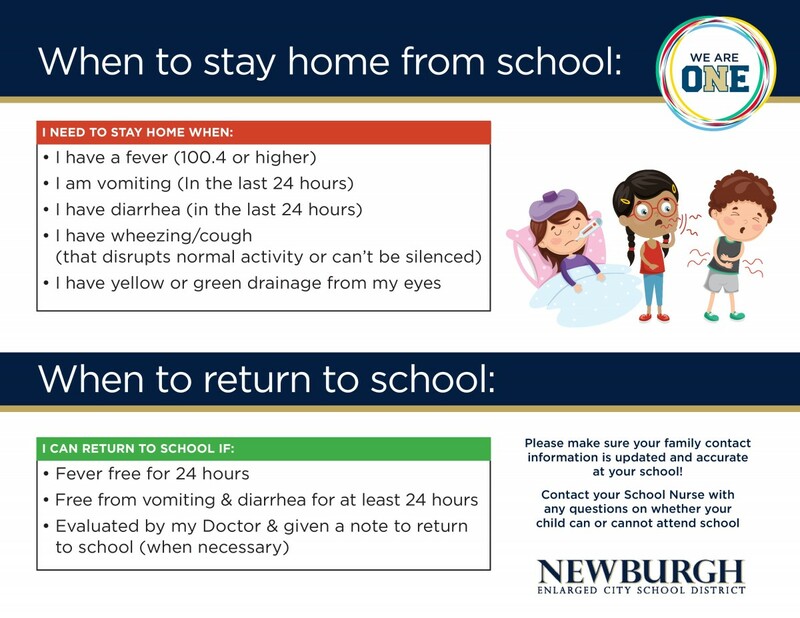 We look forward to providing parents and students in our school district with current information from Health Services as well as forms that you may print for use and return to the appropriate school health office. Should you have suggestions regarding items you would like to see please let us know. Health Services staff in the Newburgh Enlarged City School District takes a leadership role in assessing health and health risk factors. The health staff promotes resilience to ensure that students achieve optimal health and wellbeing. A team comprised of school nurses, nurse practitioners, health aides and clerks, the school physician and Health Service Coordinator monitors the health of students. Together they identify and address the unmet needs of student’s while collaborating with other school disciplines and community agencies in meeting New York State mandates for health. The New York State Department of Health has revised the regulations regarding immunization requirements for school attendance effective July 1, 2014. The new dosing requirements are based on the Advisory Committee on Immunization Practices. Students entering kindergarten or 6th grade in the 2014 – 2015 school year will now be required to have two doses of the varicella (chicken pox) vaccine and 3-4 doses of poliomyelitis vaccine. Please contact your child’s school if you have any questions. Distance acuity for all newly entering students and students in Kindergarten and in Grades 1, 2, 3, 5, 7 and 10. Hearing screening for all newly entering students and students in Kindergarten and in Grades 1, 3, 5, 7 and 10. Scoliosis (spinal curvature) screening for all students in Grades 5 – 9. A physical examination including Body Mass Index and Weight Status Category Information for all newly entering students and students in Pre-Kindergarten or Kindergarten and in Grades 2, 4, 7 and 10. A dental certificate for all newly entering students and students in Kindergarten and in Grades 2, 4, 7 and 10. A letter will be sent home if there are any findings on the screening done at school that would cause concern or need medical follow-up. Please call the Health Office of the school your child attends and ask to speak to the School Nurse if you have any questions or concerns. For Athletic Forms, please visit the Athletics Webpage.